The Front National (FN) is one of the oldest populist radical right parties in Europe. It emerged from a coalition of small far-right groups in the early 1970s. The FN remained irrelevant until it made its first electoral breakthrough, winning 11 per cent in the 1984 European elections. Since the mid-1980s, the FN has received 9–18 per cent of the vote in French presidential and legislative elections, politicizing typical radical right issues like immigration and law-and-order. It has established itself as a major political actor in the French political system, but has nonetheless remained a political pariah isolated by the so-called ‘cordon sanitaire’ between it and the mainstream right. In 2011 Marine Le Pen succeeded her father as leader of the FN. Since then, she has pushed an agenda of ‘de-demonization’ whose main goal is to detoxify the FN’s extreme right reputation. The FN under Marine Le Pen has made significant electoral gains, recently winning over a quarter of the vote in the 2014 European elections and the 2015 regional elections (see Table 1). (1) Second-round runoff; (2) Local elections with FN presence in nearly all the cantons. In the first round of the 2017 presidential election, Marine Le Pen won an unprecedented 21.3% of the vote (see Table 2). However, her vote share and progression to the second round paint a misleadingly positive picture of the FN’s performance. Whilst her score of 33.9% in the second round almost doubled that of her father, Jean-Marie Le Pen in 2002 (17.8%), the 33-point differential with political novice Emmanuel Macron confirmed the inability of the radical right party to capitalise upon an electoral context which seemed tailor-made for the FN – a collapsing Socialist Party (Benoît Hamon won 6.4%), a conservative Right-wing challenger, François Fillon, effectively silenced in policy terms by a financial scandal, and the high salience of security, immigration and European issues, three policy-areas the FN saw as its strengths. Whilst the cordon sanitaire cutting off the party from the others as a potential coalition partner had weakened through a growing ‘porosity’ of conservative Right voters, the majority of the French electorate still regarded Le Pen as a threat to democracy. Spatially, Le Pen’s vote in 2017 represented a consolidation of existing zones of electoral strength, particularly in the North-Eastern quadrant of the country - Nord-Pas-de-Calais, Picardie, Champagne-Ardenne, Lorraine, Franche-Comté, Alsace (see Figures 1 and 2). Le Pen topped the polls in Nord-Pas-de-Calais-Picardie where she received 31% in the first round. Similarly, the traditional bastions of the radical right along the Southern coast provided the backbone of FN support, in the Var (30.4%), Vaucluse (30.5%) and Pyrénées-Orientales (30%), but strengthening further in the neighbouring inland departments of Drôme and Ardèche, for example. Conversely, the West of France remains fallow for the FN, mapping across the Le Havre-Valence-Perpignan axis traditionally dividing a supportive East from the rejectionist West, as do France’s two largest metropolises of the Ile-de-France and Lyon. In Lyon, Le Pen received just 8.9% of the first round presidential vote and in Paris she won just under 5%, compared with 30.3 and 34.8% for Macron, respectively. Figure 1: Le Pen first-round presidential vote by department (2012). This divergence in the agglomeration profile of the candidates is strongly visible at the local level. 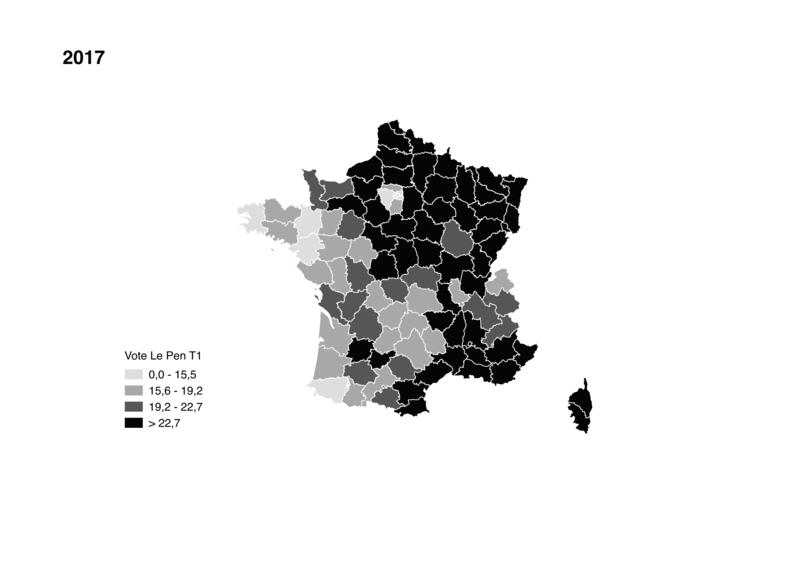 The current literature suggests that support for the radical right in France is significantly correlated with the distance to urban centres. FN voting is typically found in rural and peri-urban municipalities which show larger clusters of working and lower middle class voters that form the core of radical right support. The SCoRE project survey data suggest that, compared with Macron and indeed other candidates, almost three out of five Le Pen voters identify themselves as living in a rural or small-town environment, with half the proportion of Macron’s voters in particular living in a city (Table 3). The data seem to corroborate the so-called peri-urban vote for Le Pen, among individuals living at the interstices of urban peripheries with little sense of identity and a sense of decline (Table 4). 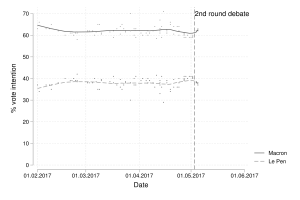 The subsequent 13.2% legislative vote in June confirmed that Le Pen’s presidential performance had not led to any momentum amongst supporters which would translate into similar vote shares, or seats (Figure 3). 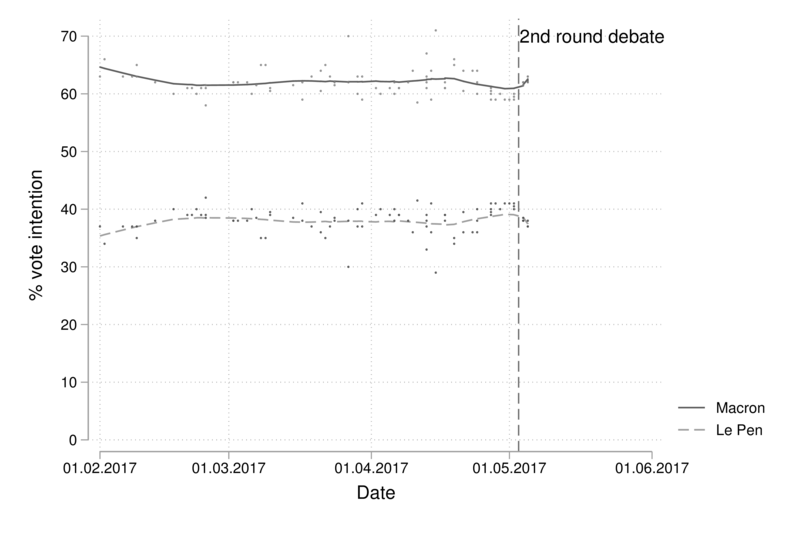 The flat-lining polling scores in the period between the two rounds, and the indications of a sharp downturn subsequent to Le Pen’s parlous debate with Macron a few days before the run-off led to demoralisation of party supporters and activists, and a sense of futility in entering the legislative race. The continuity in support along the Eastern perimeter of the country was broken up into the clusters of support in the North and the South (Figure 4), with disappointing performance in the East of the country, and almost wholesale elimination from legislative run-offs. In the same way that the first-round presidential vote share had fallen well short of the 30% targeted by FN leaders in the early days of the campaign, so the 100 target seats for the legislatives shrank rapidly. Despite a strong presence across 120 constituencies, the FN only managed to win eight deputies representing about one per cent of all 577 seats in the National Assembly. While still a fourfold increase on 2012, this was not sufficient to form an independent parliamentary group. Moreover, the competitive array that had served the party so well in exploiting its ‘nuisance potential’ in previous legislative elections, namely the three-way run-off, was absent but for a single constituency. What, then, of the bigger picture for the 2017 presidential and legislative elections? The most striking feature lies in the overturning of the French party system. 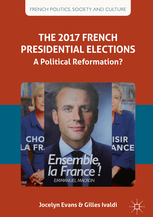 Emmanuel Macron’s victory and the absolute majority won by his centrist formation, La République en Marche (LREM) represented the greatest challenge to the institutions of the Fifth Republic in its fifty-year history. In this context, the performance of Marine Le Pen and the FN constituted a secondary feature of the elections. Indeed, the radical right party’s claim to be the only effective opponent of the ‘UMPS’ cartelisation of power was dealt a significant blow by the victory of a candidate and party exploiting the centre ground between the two former parties of government.